Lollipops are a cavity on a stick and soda is pure sugar in a can. Candy and soda cause tooth decay. You’ve been taught this since grade school. This is not news, is it? 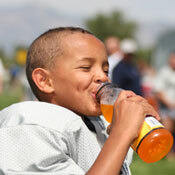 Well, what about the fact that #sports drinks ruin your teeth, too? Heard that one before? Dr. Robert Forche and Dr. David Kristal and the team at Kristal and Forche Orthodontics want to make sure you understand #sports drinks can damage healthy teeth. Actually, “erode” is more like the term, especially around the brackets while wearing braces. These sort of drinks erode your teeth by “demineralization,” or reducing the minerals in the outer tooth enamel and also the dentin (“dentin” is a yellowish, calcified tissue underneath the tooth enamel). It doesn’t affect the enamel underneath the braces covered by the brackets. #Dental erosion is common. It happens when you lose tooth structure since acids dissolve enamel and dentin. When your teeth are exposed to an acidic substance like a #sports drink, soda, or candy, dental erosion is not far behind. If you do drink soda or sports drinks, no sipping. The number of contacts with the teeth makes the problem worse. DO NOT BRUSH your teeth afterwards; it makes the problem much worse. The enamel is weak from the acid. It takes at least a half hour of saliva contact on the teeth to allow some recovery and repair before the enamel can withstand the harshness of the toothbrush. It is counterintuitive, but brushing after drinking #acidic drinks causes the problems to worsen.